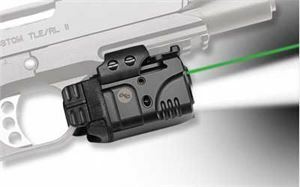 The Rail Master Pro Universal Green Laser Sight & Tactical Light combines two tactical tools in a single compact unit. The versatile unit is designed to fit most modern pistols, rifles and shotguns with an M1913 Picatinny or Weaver-style accessory rail. A powerful green laser anchors the unit and provides up to 1 hour of continuous use on a single CR2 Lithium battery. The Rail Master Pro also includes a powerful 100 Lumen white light for target identification. The unit features four operational modes including: Laser/Light Constant On, Laser Constant On, Light Constant On, and Laser w/Light Strobe. Activation is instant, with Tap On, Tap Off controls and a programmed Auto Shut Off at five minutes to conserve battery life. The waterproof unit features polymer construction with an aluminum body.